Silver body with lots of interconnected merged black dots. It also has a row of connected dots along the length of each side of the body. It has a black flash on the tip of its dorsal fin and the caudal has unconnected black dots on it. 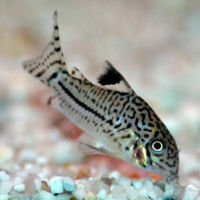 This Cory is often mistaken for species Corydoras julii as they are very similar. C. julii has distinctive black dots on its head whilst C. trilineatus has these dots joined up into groups.